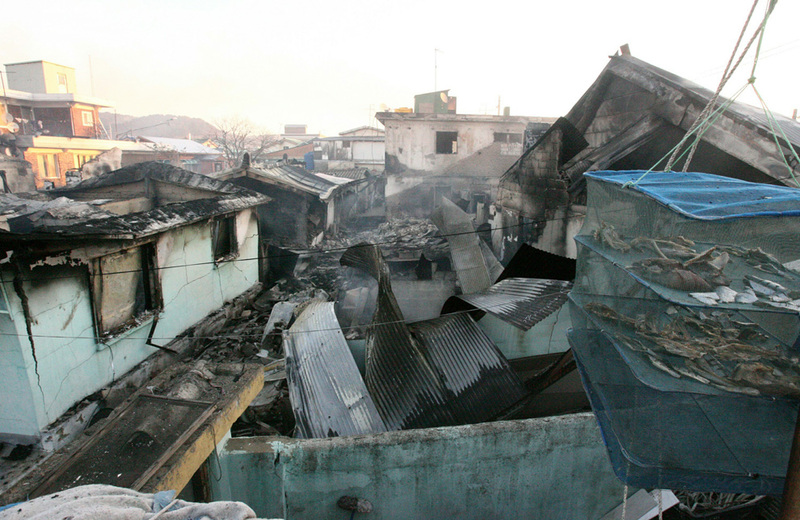 Destroyed houses on Yeonpyeong island in the disputed waters of the Yellow Sea after North Korea fired artillery shells at the island, seen on November 23, 2010. – Analyzing data sets: the future of journalism. So says none other than the inventor of the internet (no, not that one). – New York City is the most-modeled environment in video gaming. But could games also serve as architectural prophecy? – Then again, perhaps Tim Berners-Lee and the gaming industry will form a new journalism together. The ‘news game‘ is rapidly becoming an interactive tool for educating (or indoctrinating, depending on your point of view) the public. It’s certainly more fun than Cable in the Classroom (via Futurismic). – Rich people don’t need America anymore. And finally public intellectuals are picking up on their self-segregation from actual American society. The latest: Tom Ricks. Thanksgiving happened. I found an interesting organizational chart sans explanation. My most apocalyptic Fortnight article yet came out, which I quoted. I also quoted from the BBC nuclear contingency transcript. The headlines show why we’ll have been sucked dry and suckered into our own moral, societal, and financial bankruptcy. But with the Palins around, are the end times already here?